Hidden New Jersey: The Spirit of 1776, penned in Parsippany. Independence Day has always been one of my favorite holidays. No matter how you choose to enjoy it - a barbecue, a trip down the shore, fireworks or hearing a public reading of the Declaration of Independence - July 4 is a day to celebrate being free. What could be better than that? 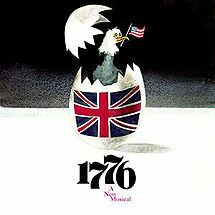 Personally, I get myself in the celebratory mood a day or so in advance by watching the musical 1776 on DVD. A dramatic recounting of the months leading up to the signing of the Declaration, the movie (and the Broadway play before it) manages to do two very difficult things. First, it makes Congressional debate both interesting and entertaining, and second, it draws plausible suspense around an event we all know came to pass. Would the Continental Congress come to agreement on independence? Given New Jersey's critical role in the American Revolution, I wasn't all that surprised to learn that 1776 was written in the state. The show's creator and songwriter, Sherman Edwards, lived in Parsippany, a few hundred yards from a road Continental soldiers trod in the midst of the war. If anyone was going to make John Adams and Thomas Jefferson musical stars, Edwards seems to have been just the man to do it. Remember that teacher in high school who moonlighted doing something cool? Edwards was one of those guys. With a bachelor's degree in history from New York University, he taught for many years in the New York City school system, but he also had strong musical chops. By the age of 16 he was playing piano at jazz clubs, starting a professional career that led him to songwriting for stars of the day like Johnny Mathis and Patti Page. Extending to film, he wrote the score for five Elvis Presley movies. It was 1776, however, that brought him to Broadway. He'd been researching the story and writing the songs for more than ten years when Peter Stone joined him in collaboration on the book. Together, they sought to provide a more or less accurate account of the work of the Continental Congress in the few months leading to the signing of the Declaration of Independence. As Stone later told the New York Times, Edwards' characterizations and research were so meticulous that he (Stone) was able to use the songs to guide the dialogue, a reversal of the usual writing process for musicals. They modified events slightly for dramatic effect, and vastly reduced the number of congressional delegates for practical reasons. Nonetheless, the finished product adeptly conveys the challenges these very human men faced as they made history in an uncertain environment. Independence, the viewer senses, was not fait accompli. Rather, the declaration was a bold move by very human men with varying convictions, faults and doubts. An ardent student of history, Edwards spent a great deal of time researching the Founding Fathers at the Morristown Joint Free Library. He cited the availability of source material that couldn't be found anywhere else, including letters from Abigail to John Adams, as one of the prime reasons why he depended on the local collection to inform his work. As for the music, neighbors at the time fondly recall hearing Edwards playing the piano as he composed. The show premiered on Broadway in 1969 to critical praise, winning the Tony Award for best musical of the season. After a two year theatrical run, it was made into a movie starring many of the same performers from the Broadway run. Even now, more than 30 years after Edwards' death, 1776 is a popular choice for amateur and small local theater productions. I guess you could say he's probably the most successful American history teacher ever. He made a historical event so interesting that students keep coming back for more! A big thank you to Beth of Poor Henry's in Montville for letting us know about the Edwards/Parsippany connection!